Agent Jay Fee reports that ex-Boston University winger Mike Grier had a troublesome knee cleaned up soon after the Sharks were eliminated in the playoffs and will be back for September training camp. The deal Grier signed in San Jose (three years at $1.775 million per) includes a no-trade clause. He'll enter the new season with 934 games played, including playoffs. Not bad for the 219th pick in the '93 draft, considered by many not to have the speed or skill level to make it beyond the minors . Pandolfo, who earned $836,000 last season and is a free agent, is expected to complete a multi-year deal in the $2 million range that will keep him in New Jersey for the rest of his career. Captain of BU's 95-96 team, Pandolfo, who was having his best offensive year year as a pro before an injury sidelined him for 28 games, finished the season with 24 points. A Boston Globe feature on Pandolfo last season was posted on the Body By Boyle Web site. Newsday reports that the Islanders will buy out the remaining year of Bates' $1.2 million contract making him aun urestricted free agent. ....under NHL buyout provisions, he will receiver two-thirds of that amount in equal installments of $400,000 spread over the next two seasons. Last season, Bates appeared in only two games, and he was limited to 48 games the previous season by a groin injury and hernia surgery. Islanders general manager Garth Snow said, “It was a decision based primarily on creating a spot on the roster for a younger player.” Snow said Bates is 100 percent healthy and has been training in Boston. A highlight of Bates' Islanders careers was scoring on a penalty shot in overtime to Game 4 of New York's 2002 playoff series against Toronto. Here's the video, via YouTube. Four incoming Terriers and one 2009 recruit were picked on day two of the 2008 NHL Entry Draft. Early in the fourth round, U.S. NTDP U18 teammates Vinny Saponari (photo) and David Warsofsky were selected back-to-back at #94 and #95 respectively by Atlanta and St. Louis. 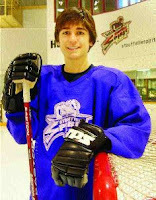 Following older brother Victor to B.U., Saponari, who played for Culver Academy before joining the NTDP, became the second Georgia-born skater drafted by the Thrashers. He discussed his excitement over his selection with the Atlanta Journal Constitution, while more coverage appeared on the Thrashers’s Web site, and hockeysfuture.com and on the Associated Press wire. After the Atlanta Thrashers made Vinny Saponari the first true Georgian to be drafted by the NHL, general manager Don Waddell jokingly gave his daughter Chelsea credit for making the initial scouting contact. "She Facebooks with him," Waddell said, laughing. "I just told him on the phone ... my daughter is older than you." Waddell said his daughter had mentioned two months ago that she had met a player online from the U.S. National Training and Development Program. Speaking of Vinny Saponari, he was in Duluth this morning at the Thrashers' youth summer hockey camp. He was on the ice with the kids and he did at least three TV interviews with local stations. ... It's a big deal for hockey in Georgia to have a kid that grew up going to Thrashers hockey camp get drafted by the hometown team. Warsofsky, the super-skilled, diminutive defenseman, was the Blues’ choice early in the fourth round. St. Louis was a bit of a surprising destination as Warsofsky hadn’t had much contact with the club. The Marshfield, Mass., native, whose godparents are the parents of ex-Terrier captain and Bruins coach Mike Sullivan, talked about his draft day experiences with the Patriot Ledger and New England Hockey Journal and in a video interview with NESN. HockeyBuzz.com was one of several media outlets to compare his game to that of another smallish offensive defenseman, Brian Rafalski, the former Wisconsin All-American, who won the Stanley Cup with the New Jersey Devils and again this year with Detroit. passes in his own end .. has the capacity to skate the puck out of trouble as well .. can be dangerous in transition, as he possesses the gentle hands and smart vision to make a quality outlet pass also capable of keeping the puck and leading the rush himself does not look to shoot from the point that often, as he prefers to utilize his productive passing game to set up teammates .. however, he will pinch at times, as he loves to crash the net and be on the receiving end of a one-timer .. because of his puckmoving abilities, he sees regular time on the man advantage. McKeen’s also published a post-draft recap of New England based draft choices, noting the common belief that if Warsofsky was a few inches taller, he’d have been a first or second round selection. David Warsofsky (StL), D, U.S. Under-18 – fourth round, (95th overall) Committed to Boston University for 2008. Despite lack of size (5-9) he is an extraordinary player with exceptional skill, especially on the powerplay .. a smooth skater with a strong stride .. tremendous vision and really moves the puck up the ice well .. tremendous patience and poise with the puck and hockey sense.. great one-timer with rocket of a shot and accurate, especially on the PP .. has a pro-like shot and may have the best shot for someone his age or even older .. finds open areas on the PP for good shooting lanes .. can be physical if needed and strong along the boards .. logged a ton of icetime .. has the ability to shake checks with his quickness and stick skills and ability to take hits and keep going. What Other Scouts Are Saying (Central Scouting): Warsofsky is a small, smart defenseman with quick feet. He has good speed jumping into the play and a big shot from the point. At his size, he needs to take better care of the puck and continue to get stronger, but overall, he comes to play and plays bigger than his size. Synopsis: An excellent pick by the Blues and if he was even 5-11, he probably would be a first or second round pick. He is extremely talented and playing at Boston University will really help his development. He tallied 32 points (nine goals, 23 assists) in 48 games last season. A month from now, Corey Trivino returns to Ottawa, where he was drafted by the Islanders last weekend. This time, he'll be donning the red and white maple leaf sweater, once again, as one of 45 invitees to tryout camp for Canada's World Junior Championships team. And just as when he was a member of Canada's gold-medal World U18 Championships team, Trivino is the only participant coming out of a Junior A league. Trivino, who scored four goals and three assists at the World U18 tournament in Russia, also was selected for last fall's World U17 Challenge and played for the 2007 Canada U17 team. Five Terriers have been invited to the U.S. WJC camp in Lake Placid in early August: forwards Colin Wilson and Vinny Saponari, and blueliners Kevin Shattenkirk, Colby Cohen and David Warsofsky. Our draft recap continues with two players chosen by Original Six teams: 2009 recruit Max Nicastro, chosen in the 3rd round--#91 overall—by Stanley Cup Champion Detroit, and goalie Grant Rollheiser, chosen by Toronto in the 6th round. Don't expect to see Nicastro in Detroit overnight — it's going to be a long wait. The Red Wings hope he'll be a top-four NHL defenseman in about seven years, so they'll let him develop at his own pace at Boston University. Nicastro has good upside if he can put it all together. Nicastro is a right-shooting defenseman who can best be described as a jack of all trades, master of none. And that's not such a bad thing -- you can carve a seasoned NHL veteran out of a guy like that. As Detroit Red Wings veteran amateur scout Mark Leach put it, "I don't think he has one unbelievable asset, but he's good at everything." ..."He's a No. 4 or 5 type of guy," Red Wings assistant general manager Jim Nill said. "He won't be a big offensive guy, but he moves the puck smart and safe, he can play the power play but he's not a big point producer. He's got good size and he competes hard defensively. He's a well rounded defenseman." Nicastro spent his primary development years playing hockey in the Los Angeles area, which is not exactly a hockey hotbed. Understandably, the 18-year-old got off to a tentative start in his USHL rookie campaign. But as the season progressed, the Red Wings watched him get more and more comfortable, and he finished the year a plus-7. "He plays a willing physical game and isn't afraid to step up on guys," said Red Wings amateur scout David Kolb, who focuses on the USHL. "His defensive game should only improve as he gains strength and grows into his body. He has a pretty good frame to work with and has room to get bigger." The Wings took Nicastro, a self-described “finesse defenseman” who grew up playing roller hockey in California, in the third round. Nicastro said he patterns his game after Nicklas Lidstrom and wanted to have dinner with Scotty Bowman. “I talked to them once on the phone last week. I thought it was a quick, little talk,” Nicastro said. “I had no clue it was going to be the Wings, so I’m pretty excited. Words can’t explain it. It’s quite an honor.”Nicastro, a native of Thousand Oaks, Calif., didn’t play ice hockey until age 12. “I think that’s where I got most of my finesse moves and skill from,” Nicastro said of roller hockey. “When I started playing ice, that’s when my defense started to kick in.”Nicastro will play another year with the Chicago Steel of the U.S. Hockey League, but has committed to Boston University. "Max needs some time to develop, but he has an excellent shot from the point and s a good skater. He is a physical player and moves the puck well but could be a little stronger and more active in front of his own net." Grant Rollheiser wasn’t ranked by Central Scouting or any of the other ranking services, but his selection by Toronto in the 6th round, #158 overall, wasn’t a complete surprise as the Leafs had been in contact with the incoming Terrier goaltending several times. The Trail-Crossland News interviewed Rollheiser, who has been in Boston, taking summer semester courses, following his selection. Shawn Mullin’s Smoke Eater Blog reveled in the news. Just prior to the draft, Mullin posted links to a series of audio clips with Trail’s goalie coach, Pasco Valana, who discusses Rollheiser’s strengths. ( 1,2,3) Mountain Radio in British Columbia interviewed Rollheiser who reacted to his selection and noted he'll be attending Leafs development camp this summer. BU’s six picks in the entry draft were tied with North Dakota for second most, just behind Wisconsin’s seven. As College Hockey News’ Adam Wodon noted,” For the Sioux, that's not an unusual amount in recent years. But for BU, it's not a typical amount in the recent past.” BU had three players selected in 2007 and four in 2006. CHN provides a full list of college players and recruits who were drafted. Colin Wilson becomes the ninth Terrier to be selected in the first round, the second in two years as Kevin Shattenkirk was the 14th overall pick last year. Classiest move in the draft was made by Tampa Bay, drafting David Carle in the 7th round. Carle, brother of Shark’s blueliner Matt Carle, is a Denver recruit who was expected to be picked in the second round. Last week, he discovered he had a heart condition that will end his hockey career and informed the NHL. The Lightning’s new incoming owner, Oren Koules, said on the team's Web site: "The kid worked his whole life to be drafted in the NHL, and I didn't see a reason he shouldn't be." Denver is honoring his scholarship, too. Colin Wilson and fellow first round draft choice Chet Pickard are expected to attend the Predators 2008 prospect camp beginning this Thursday. Wilson relates that, as 14 year olds, he and Pickard were cut from the same traveling team. TFP TV provides an interview with the two longtime friends, who likely will be opponents during the next World Junior Championships. Poile said. “We think he plays the offensive game very well and he is a shut down guy on defense. I can’t tell you how passionate our scouting staff was about this being the guy we wanted.” Wilson said he is not certain if he will return to Boston University for his sophomore season or become a professional player. But Poile indicated he wants Wilson to stay at Boston University for at least another season.“We haven’t sat down with him, but we think he is in a good place,” Poile said. THFBlog comment: After his convincing physical showing at the combine and seeing Nashville trade up to get him, it's easy to understand Wilson thinking he's ready for the NHL. He wants to be thought of as an equal to Stamkos, Doughty and Bogosian. Moreover, he fills a big need for the Preds--a center with size--although that is a future need. They still have 6'4" Jason Arnott, who scored 72 points last year. On the other hand, scouts feel his skating still needs some work and, despite the maturity shown during interviews, Wilson, who won't turn 19 until the fall, may not be ready for life in the NHL just yet. The Predators senior staff is led by former college players, including ex-Terriers Paul Fenton and Jeff Kealty, and the organization has shown patience in the past. Poile's comments are encouraging as is having his friend Pickard also selected in the first round but headed back to Major Junior next season. Wilson's performance in this week's development camp may play a part in the decision. primarily a playmaker but also has a very good shot. He does a good job of getting to the open ice. He has excellent hockey sense and sees the ice well. Corey brings a lot creativity and is a good kid. We're excited to get Trivino in the second round of the draft. He will be attending Boston University in the fall. Our coverage includes two video interviews with Corey immediately after his selection (1, 2), and a review of Islanders picks from NHL.com. Trivino's hometown newspaper reports that Corey traveled to Calgary on Sunday where Canada’s U!8 team was honored for its gold medal performance and that he’ll graduate from high school tomorrow. Stouffville (OPJHL) center Corey Trivino was the first player with New England ties selected on the second day of the draft. Trivino, who posted 19-50-69 totals last season, will attend Boston University starting this fall. The New York Islanders used the 36th pick overall to select him. “The facilities, the coaching staff, they have everything there,” said Trivino when asked why he picked BU. Trivino, who stands 6-foot-1, 170 pounds, said he opted to go the college route to he could more easily continue to get bigger and stronger. He also said that he’s crossed paths a few times with his potential BU teammate Colin Wilson (Greenwich, Conn.). Wilson went to Nashville at No. 7 Friday night and might turn pro as soon as this season. “Probably at orientation I’ll try to convince him to stay,” Trivino said. According to three mock drafts released this week, BU just may have two first-round NHL draft choices for the first time. Red Line Report editor Kyle Woodlief’s mock draft for USA Today projects Colin Wilson going 9th overall all to Nashville and Corey Trivino 25th to Montreal. ESPN’s mock draft has the same destinations for the two centers, while The Hockey News has Wilson picked 8th by Phoenix and Trivino 30th by Stanley Cup Champion Detroit. In the aftermath of his showing at the combine, Wilson continues to be a hot commodity among scouts and in the media, with articles appearing in The New England Hockey Journal, The Boston Herald and Hockeysfuture.com. Colin authored his third predraft blog entry for NHL.com, and in TSN’s top 60 draft prospects, Wilson was ranked 8th and Trivino 36th. USA Hockey has announced the 53-man roster for U.S. Junior National Team camp set for Lake Placid in August. Wilson, Kevin Shattenkirk, Colby Cohen and incoming freshmen David Warsofsky and Vinny Saponari received invites. Wilson led the 2008 U.S. Jr. National Team in goals scored with six. With the 2008 NHL draft just a week away, current and future Terriers continue to draw attention. "He's a boy playing against men...an 18-year-old playing against guys, some who may be 25 years old in the NCAA," said McGuire. "He's an offensive threat and power forward playing against older players at Boston University. He'll be a single-digit draft, somewhere in the top nine and I think a nine-year NHL pro." Delving further into Colin's hockey roots, it goes on to point out that his grandfather, Gerry, who played briefly in the NHL, "had a large hand in bringing Ulf Nilsson and Anders Hedberg to the WHA Winnipeg Jets in the 1970 when Wilson was the club's orthopedic specialist. " California native was selected by the Indiana Ice in the sixth round of the 2006 USHL Entry Draft with the 68th overall pick. Before joining the league for the 2007-08 season, the Ice traded his rights to the Chicago Steel. Nicastro finished as one of one of the top rearguards for the team. He collected 20 points (4 goals, 16 assists), 78 penalty minutes and a plus-7 rating. He also was a member of Team USA at the 2007 World Junior A Challenge.The young defenseman has taken some big steps to play effectively with in the USHL. He plays a very good all-round game, but is first and foremost very responsible in his own end. or join the rush when needed. He makes good reads at both ends of the ice. He has showed that he is able to get on the right side of the opposing player and attack effectively, causing turnovers with his stick work. He’s good at closing up lanes and stealing passes. He was used in all situations for the Steel and played on top power play and penalty-kill units. Nicastro has good offensive upside, plays the puck well, has good vision and big shot. Nicastro will return to Chicago in the USHL next season before joining Boston University in the fall of 2009. 2008 recruit Corey Trivino, whose stock has been steadily rising, received a pair of strong endorsements last week. In The Hockey News’ Bests of the Crop feature, Trivino was rated the top playmaker available and favorably compared to RPI and NHL centerman Adam Oates. And, in International Scouting Services’ final draft rankings, Trivino was ranked #26 overall with Wilson ranked #8. Call him one of this year's top wildcards. When left shot center Corey Trivino committed to Boston University back in August of 2006, the Terriers knew they had someone special. Trivino could wind up even better than that. At 6-1, and 170 pounds, Trivino's had two strong seasons with the OPJHL's Stouffville Spirit, and scouts like what they've seen. He also did well this past spring, as his Canadian World Under 18 squad won gold versus the Russians in Kazan. "He could be a home-run guy," said one scout to The Hockey News, which adds that he's a "far better playmaker than goal-scorer, his skills with the puck are something to behold." Says Red Line, which has Trivino 40th overall: "He has the goal scoring ability teams covet....He has an array of shots he can unload quickly with accuracy." If there's one area Trivino needs to improve on, it would be his strength. "He's pretty weak physically," one scout said to THN. And adds Red Line: "Slight build and doesn't initiate contact, but (he) isn't afraid to take hits to make plays." Two years ago, Corey Trivino skated alongside phenoms Sam Gagner and John Tavares for the Toronto Bantam Marlies and was hardly out of place. Last season, he played 30 games for the Marlies' midget minor squad and scored 17 goals and 39 points. This month, the 16-year-old centerman officially signed on to play next season for the Ontario Provincial Junior Hockey League's Stouffville Spirit, the circuit's playoff runner-up last year. Although he's property of the Ontario Hockey League's Barrie Colts – the franchise chose him with the 88th overall pick in last month's draft – Trivino, whose personality and work ethic transcends his age, is committed to taking the D-I route. what he did on the ice, but also what he did before and after," says Stouffville head coach Dan West. "Without even being asked, Corey was first to offer to fill the the water bottles and he could have easily played for my team last year. He's always been considered a special kid, and the spotlight's going to be on him next year. But he'll handle it, because he's very mature." This weekend, NHL.com examined the phenomenon of dwindling numbers of NHL prospects emerging from Massachusetts. Both Mike Eruzione and Shawn McEachern weighed in with opinions. Corey Trivino was named the top prospect in the Ontario Hockey Association at the organization's awards banquet last night. OHA is the umbrella organization for 12 leagues with more than 130 teams. Fore ! The annual Boston University Men's Ice Hockey Golf Tournament will be held on Monday, June 9, at Tedesco Country Club in Marblehead. Proceeds of the event benefit The Friends of BU Hockey and the Ron Dion Scholarship Fund, which will be permanently endowed to provide scholarship support to one or more student-athletes on the men's hockey team. Dion (CAS '68)was a philanthropic Boston businessness and a longtime supporter of BU Hockey. Rich Alger, a defenseman on the 95-96 and 96-97 Terrier squads, is an assistant coach for the EJHL Bridgewater Bandits.